It’s a long wave. I think of everything as being interdependent or part of an ecosystem, philosophically and biologically. There are urgent moments of crisis where the waves are crashing on the land, which are the moments that activists quickly rise to. But then there’s the long waves, behind them, that are holding a space. They’re affecting generational change, through educational, cultural methodologies. I see myself as being part of that [long] wave; I want to stay in there and be vigilant all the time. 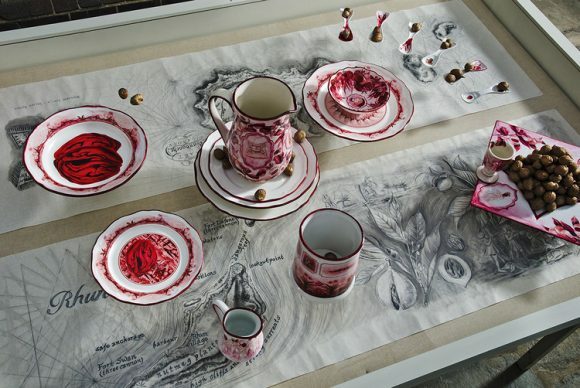 Beatrice Glow is an artist and researcher who tells the little-known stories of everyday objects that have had a significant influence on world history. By way of educational installations, she introduces counter-narratives to myths that have been normalized by colonialism and imperialism. Glow is interested in breaking down the barriers that have been created by these myths, especially the social imaginaries that people create to understand others. She is a Fulbright Scholar, recipient of multiple international grants and fellowships, and is currently the artist-in-residence at New York University’s Asian/Pacific/American Institute (2016-2017). Editor’s Note: This interview took place eight days after the election of Donald J. Trump. Sarah J Halford: Can you tell me a little bit about yourself? Beatrice Glow: I’m a diasporic daughter of Taiwan, born in California. I’ve been a guest of Mannahatta – this land we’re on [NYC] – for the past 12 years. I would like to think of Taiwan as a crossroads of Asia-Pacific. It’s gone through so many ways of colonization. Portuguese, Dutch, Japanese, Chinese, English…I’m in many ways a crossroads of that. I also like to think of Taiwan as a very interesting place in the history of humanity, because 6,000 years ago the Austronesian peoples left Taiwan on canoes and they were able to travel onwards and settle on the islands from Taiwan to Madagascar, Papua New Guinea, Indonesia, Tahiti, all the way to Hawaii at Easter Island. All of that region has relations that eventually trace back to Taiwan. So, some in Hawaii can actually communicate with elders in Taiwan. That informs a lot of my ways of carrying forward and thinking about how I am related to the human beings that I encounter every day. SJH: How would you describe your work? BG: I think of myself as a storyteller. I take a lot of counter-narratives – the ones that are usually tied to colonialism and migration – and I find ways to weave them through into our present. Right now I’m really focused on social-botanical history; ways in which plant objects that find their way into our kitchen cabinets reveal so much of the formation of globalization. But I use easy access points to tie into daily lives and think about the ramifications that little decisions that were made affect the world around us. SJH: So what kind of “easy access” points might those be? BG: Right now I’m talking a lot about nutmegs; I think most people know nutmegs whether it’s through a holiday drink or something spicy they put on their coffee at Starbucks. I tell the story about how Mannahatta was traded by the Dutch in the 17th century for another island in Indonesia in the fight for nutmegs. That always sparks a lot of imagination in people to think that – what? That’s the founding myth of our island? I thought this island was purchased for $26! And I think that that conversation starts to unravel and people enter the story through that perspective. And then you can talk about really deep concepts such as trans-local colonialism and how everything’s intimately connected through the centuries. I recently worked on the medium of: What is perfume? through creating this pop-up perfume store that takes on the aesthetic of a perfume store in a shopping mall, but through that I went over the history of each scent and plant behind them, and the ways in which they played really critical roles in the formation of globalization during the Age of Discovery. So, I talk about nutmegs and how that led to the trade of the spice islands with New York. I talk about black pepper – after the English lost the first colony of Rhunin present day Indonesia’s Banda Island archipelago, they went to India and said, “Alright, we’re going to conquer this market.” So that led to a whole other wave of colonization. I talk about these domino-effects in a perfume shop, and that allures an audience that I find normally wouldn’t go into an art space. An art space presents this hierarchy, and in a shop it’s broken down into consumer language, which is I think becoming a universal, international language at this point. So, how do we find new ways of reaching out to folks? That’s the biggest challenge that I think educators and artists face today. SJH: So, when people would visit the perfumery, what is it that you wanted them to take away from that experience? Was there any specific goal in mind? BG: I want them, first, to have something that they haven’t experienced before: that you can have something that is pedagogical, beautiful, immersive, and olfactory all in one space. I want them to have an experience that doesn’t come off as didactic, but as a learned experience. So, I think that was one key that I wanted people to depart with. We’re so tired of being spoken to all the time, and our optic nerves feel very tired of all of this information that is saturating, so how can we find other senses? We’re in a very fragmented moment, I think, where a lot of us feel dehumanized in the sense that we are just reduced to being consumers, we’re reduced to being receptors of propaganda. So how can we activate other senses in our body to realize that we’re fully human? In here I wanted this entire aesthetic experience; I was also engaging with smell that brings us back to our stomachs, our brains, our senses, and kind of activates that part of us that’s often neglected in institutional spaces. SJH: What do you want them to do with that information? BG: I want them to go to have dinner with people and go, “Oh yeah! You know that spice? Let me tell you a story…” And they’ll share that. I think word-of-mouth is very powerful, and imagination that’s activated is very powerful. And I want them to question everything around them: question the value and importance and weight of every miniscule item that they encounter. To become more active thinkers around how this plate of food came to be – the cycles of Earth, the water, the rain – how is all of that a factor of what you’re able to eat today? Including the truck that had to transport them, the air they had to travel through, and the labor. So, one has to think about a more interdependent ecosystem that we all are apart of instead of feeling that we’re all individuals that aren’t affected by what happens around us, and how little actions do have ramifications. I think that is the power of education and cultural work. You know, you and I were talking earlier about reshuffling our priorities in a time where we feel like the work that we’ve been doing has not been enough, that we’re in echo-chambers [re: Trump presidency]. And I think a big part of it is that we have to reaffirm our question or change our tactics in a time of crisis. There’s a lot of people who want to organize, who are feeling very passionate to organize, do something, get on the street and protest, but that feeling of a revolutionary moment needs to be carried forward, and we need to be in there for the long-haul. I think that’s where education and culture is so important in terms of continuing the daily efforts of teaching ourselves and thinking through how to self-organize and how to do the groundwork in this moment of hateful speech that is oozing out of the media and hate crimes that are popping up around our country currently. Knowledge as hegemony needs to be disrupted. I think more and more about the way in which the media has been trying to make everything into very binary relationships; we’re sort of flattening our conversations. It’s intentional. It’s also trying to make sure that people don’t have critical thinking skills and I want to trust that we are all capable of that and continue to speak to people in that way, trusting that they have that capacity and to nurture that at the same time. Pictured: “Aromerica Parfumer” with the Museo Nacional de Bellas Artes in Chile, by Beatrice Glow. 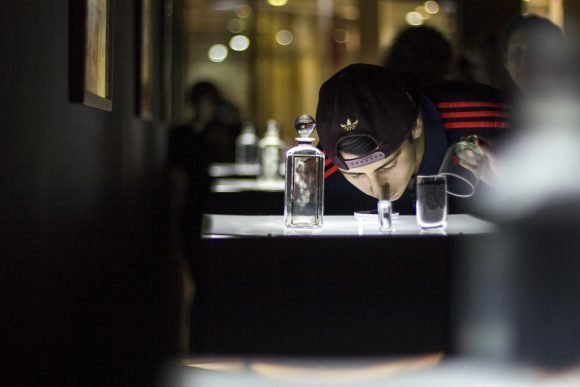 This exhibit took the form of a perfume store in the Mall Plaza Vespucio and explored the ways in which plants – and their spices and smells – shaped global history. SJH: You’re currently doing an artist residency at NYU. How did you get involved with the university? Beatrice Glow: That’s a long-time affair. I did an undergraduate here and after I left I went to Peru for a Fulbright, but I continued to stay in conversation with the Hemispheric Institute. Through that I eventually got involved with the APA [Asian/Pacific/American Institute at NYU] after many years of being back in the city and working. I became a visiting scholar at the APA for four years and the residency made a lot of sense – what I’m interested in researching on my own and the institute’s interest in pursuing ways of thinking through Asian Indigenous intersectionalities. Given that we’re having a moment [of] asking some really urgent questions around environmental racism in this country, and how to shift and disrupt this idea that diasporic peoples are complicit in colonial society, it made sense to rethink our position as allies, so here I am working with them. SJH: Can you tell me what you mean by “environmental racism”? BG: That’s a big term. We’re in a time where resources are exploited and distribution is not equal. Often times people who have access to clean water supplies are privileged, and people who are not deemed important to society, or [considered] “disposable” populations – indigenous communities historically have been treated that way and it’s a form of erasure. That’s something we’re talking about. We’re looking at Flint [Michigan] as a water conflict in our country; that’s been a large part of what’s happening in Standing Rock. These are all just symptoms that have been going on for quite a long time. Even in New Jersey we have the Ramapough Lenape people who in the past year said that over 9 people in their clan have died in their community due to water poisoning and pollution, due to toxic waste poured on their land. These things are dumped purposefully on reservation land or indigenous land to be hidden away from the “mainstream.” I think of environmental racism as social Darwinism, as eugenics, as social policies meant to reinforce a certain hierarchy here – white supremacy. 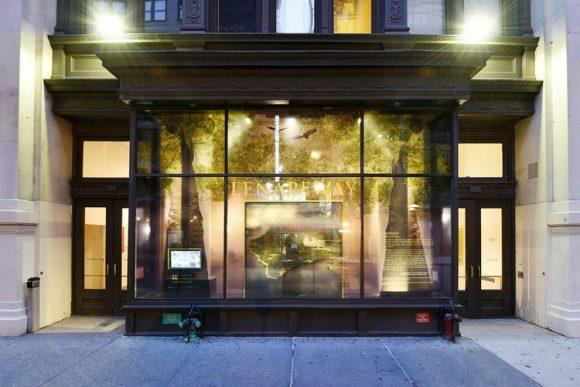 Pictured: “Lenapeway” – an installation by Beatrice Glow and The Wayfinding Project at the Asian/Pacific/American Institute at NYU. SJH: If you were to characterize one of your works as a “success” what would that be? 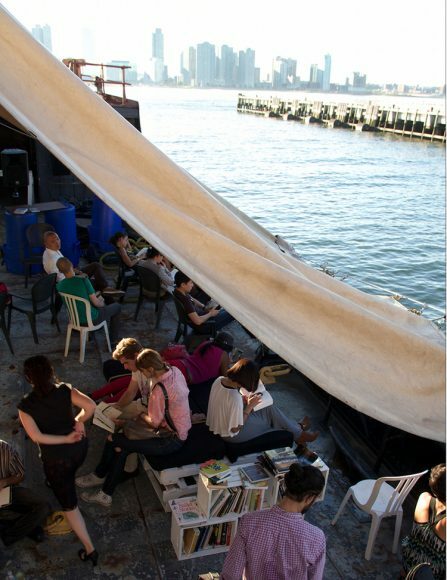 BG: Something that was very media-friendly was The Floating Library that I created in 2014 on the Hudson River. That had over 4,000 visitors – with no advertising – over one month. It was a pop-up library. It got so much press coverage that some days I had to do three interviews at once. Major media wanted to cover it, and but also when people flooded in they showed that desire to connect with [other] people, to unplug – I asked people to turn off their cellphones when they were onboard. I think that what was so powerful was just being together. This sense of wanting to engage with other senses such as being on water, reading, doing hands-on DIY projects, having really amazing conversations with strangers that you wouldn’t normally have in a bar or on the street. There was a lot of cultural momentum in that one month. I think that I would measure that with many moments of success in there. Such as, one day it was starting to rain on the boat and people would just come and help carry all the books inside. That was a moment when people were recognizing the value of books and of teamwork and that there was no customer service. I thought that that was surprising to see that moment of activation; I didn’t need to lay down the rules because it was about collective placemaking. I thought those were small moments that prove to me that this is a possibility and we need to have more spaces like this to practice being together with strangers and also trusting each other. SJH: So, the art was at the center of those small moments? BG: Yes, and I think the successful part was people relating to each other in a positive way. I think the power of art is that you can be as in your face or as subtle as you want. In my work, I don’t think I try to antagonize people immediately, I try to approach it from a human perspective. So you don’t see my work in use of politics very clearly because I feel like you can alienate people very quickly. I think more and more in these conversations we have to talk about colonizers and marginalized communities or people who have been erased. It’s difficult, especially if I’m with people who either have complexities around white guilt or who don’t consider themselves responsible as descendents or as people who benefit from it. But I try not to antagonize people, I try to talk about it as a majority-minority conflict instead of adding words and code to the conversation. I think it’s always about asking people to reflect upon that there is no hierarchy of oppression. It’s about coming to a basic place of: how can we move forward, acknowledging that there are these power plays in society. And I think if you can channel these conversations toward a point about how to strategize and be productive together, then people don’t take it personally. It shifts that mood. There’s nothing productive in making anyone feel bad about being complicit. SJH: You said that you aren’t explicitly political in your work, but would you consider your work to be a political act? BG: I think everything we do is political, even if you’re choosing not to participate, that’s also political and it’s perpetuating certain dynamics. Everything’s inherently political, I believe. I don’t use the word “political” because I don’t want that to be the only place that we can understand our ways of being. I want us to really understand, first and foremost, that we’re humans in this human experience. SJH: So why choose art to communicate that perspective? BG: Art is like a snake; it moves through different sectors. It can come off as innocuous in certain societies where art isn’t seen as anything that can affect change. So, [art is] a platform in which you can still say things in a cultural space. I lived in Peru for two years, and because I entered in as a researcher and artist – and a young woman, I have to say that – people didn’t take me too seriously. Because of that, I was able to enter many different social circles, from being friends with the woman at the supermarket who sells juice and learning about her stories, to meeting politicians and so-called “high society” people who are like, “Oh an artist! And American! We’re curious. Let’s meet her.” So, I think that taught me early on that if I can use that role of the artist to allow me to weave through different systems and dynamics, I can tell a much more truthful story. And if I were to come in as a politician or say I’m a journalist, people will immediately shrink up or put on a mask or say something different. SJH: Do you consider your work to be artistic activism? BG: This is hard. You asked me this before the election, but how do I feel now? I’m still going to say no, because I don’t feel like I’m doing enough currently. SJH: What would be ‘enough’ for you to consider yourself to be an art activist? BG: If I’m actually having tactical strategies to change policy. If I’m actually actively organizing people or being part of an organization that wants to mobilize and who wants to do art actions explicitly targeting certain issues, then I would say that is a more explicit way of thinking about artistic activism. I’m not sure I am, given my work. Maybe it’s an old way of thinking, that activism is addressing urgent issues. I think those definitions are becoming more and more loose, that’s why it’s a hard time to discuss what that really means. But I do feel like, with my daily life, I try to carry those revolutionary moments into the classrooms when I speak with a crowd of folks about why I choose to work on certain subject matters over other ones. I could be making beautiful art objects and be very happy about trying to make a gallery sale, but I find so much more fulfillment if I can tell a story that has been erased from our knowledge or that’s just not going to make it into the history books. So, yes, that is a type of artivism. But it’s not the one that we tend to romanticize – the one that’s on a revolutionary platform. I also want to acknowledge that a lot of activists really put their bodies on the front line and they make art for political means. Mine can go both ways. So, I don’t want to claim that; I want to give that space for folks who really are doing that and who really are risking their lives. I don’t know if I have those guts to put myself in those kind of shoes. Have I been tested? Have I been brave enough? But a lot of people do this kind of work not because they’re brave but because they’re forced, they’re desperate and they have to do those things. So, those are questions that I think I’m still struggling through, as a lot of us are. SJH: But your work can certainly advance knowledge around colonialism or imperialism or national myths. Do you see it that type of knowledge work as an effort toward social change, in general? BG: Absolutely. It’s a long wave. I think of everything as being interdependent or part of an ecosystem, philosophically and biologically. There are urgent moments of crisis where the waves are crashing on the land, which are the moments that activists quickly rise to. But then there’s the long waves, behind them, that are holding a space. They’re affecting generational change, through educational, cultural methodologies. I see myself as being part of that [long] wave; I want to stay in there and be vigilant all the time. But how do you measure that? That’s going to be difficult because – well, time is speeding up – but people used to say that it takes about 60 years to see a change. So, I hope that by the time I’m an old woman I might be able to see a little bit of change, if I get to be lucky and see that. SJH: When you’re creating pieces do you actively think about change? BG: I do, especially if what I’m speaking on is on a time wave, but I also think about geological timescales and our relationship with land and waters and Earth and the non-human animals that also are affected by us, I think about all these things and how we’re so intimately networked. A lot of my work is about social imaginaries. I think the media is very good at spinning myths about “the others.” Every one of us have made decisions around this election for probably a range of personal or political or sometimes erratic choices. We all have our way of way-making. But there’s also this myth right now in hearing people who are imagining the Trump supporters as a largely white-working class rural population, but we’re finding that actually, a lot of people around us have chosen him. Those are myths that we need to start to unravel, around why we have these “Us vs. Them” dynamics. There are also social imaginings of how Hillary supporters were too – from these privileged, elitist, coastal towns. Everyone has all of these names and they’re very painful and really divisive. They’re creating psychological borders and ways in which we can’t start to see people wholly when we see them as “this” political agenda or “that” political agenda, and that is a very dangerous thing. So, I work with social imaginary in my work such as: how do words carry weight? For example, I’ve been working with the word, “Chino.” It means “Chinese” in a very basic way, or “Asian,” but actually Spanish-speaking Latin America has so many different ways of using it. It could mean 50 cents or marijuana, or orange juice, it can mean cat or ladybug – chino/chinita – and so through that one word I dissect ways in which a full etymology evolves and what we project onto this imaginary “other.” That goes into the conversation on smell – so all of that imagination, seduction, desire for something distant and abstract, and that are invisible things that we can’t grasp but really shape our public opinion around things we barely understand that we are quick to form judgment around. So these are ways in which meanings are things that get pulled into my work, where we throw them around so carelessly, where it can later be used to form policy. I want to get more specific into the words that we’re rallying around. It’s also about love, which might sound cheesy, but I feel that it’s important that we do not let this moment poison us and we continue to use education and culture to plow forward, as many of our predecessors and ancestors in the field have been preaching for years.